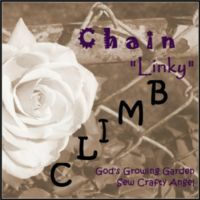 God's Growing Garden: June 2014 Chain "Linky" CLIMB & Giveaway! June 2014 Chain "Linky" CLIMB & Giveaway! - 2 Sidebar Ad Spaces on God's Growing Garden - $20 value - Ad Space on Sew Crafty Angel Total prize value over $100!! - correspondence is done through email and the winner's email addresses will only be used to deliver or set-up e-prizes. Email addresses will NEVER be sold or shared. Now onto the CLIMB (blog hop): We have changed it up a bit - instead of linking your homepage you may now link up to 4 of your family friendly blog posts per month!! By participating in this blog hop your understand that your link might be promoted on social media. Also, by participating in this blog hop your email address will be added to our CLIMB list & you will be sent an email reminder next month. Remember - If you co-host you will receive a free Weekly Sidebar Ad and your blog button will appear on both Angie's blog & Angel's blog!! Please checkout this month's wonderful Sponsor!! I am now following you on Bloglovin, Pinterest, Twitter, FB and G+, hope you can do the same. My Hubby Makes Me Laugh #1 - "Our Dog Gourdon"
Prayer Warrior #4 - "Prayer & Persistence"
BLOGGER OPP - "A Conquered Mess" Turns One!